Although I am not a huge World Cup fan since the tournament has become the definition of industrial football and mainly a cynical money making machine in recent years, I still can’t ignore the shirts. With the games in full swing I thought I would do what some sites have been doing and rank the top five shirts from World Cup 2014, along with the top five from the past World Cups that I have watched. As with everything on this blog all opinions are my own, so don’t be offended if your favorite shirt—or team—does not make an appearance. Personally, it is always hard to rank the newer shirts because the old ones hold a special place in my heart but here goes nothing. The “electricity” colored away shirt obviously needs no explanation, but the blue home shirt has a few details that make it, in my opinion, one of the best shirts of the 2014 World Cup. The rising sun motif around the badge is special, giving a sort of Japanese authenticity to the shirt. On the back, however, is a pink stripe that gives this jersey a unique detail that—when seen in person—really gets your attention. Adidas did a nice job with the socks as well, carrying that color through the kit instead of leaving it as a one-off detail on the shirt. It also harkens back to the red used in Japan’s 1995-96 kit, manufactured by Asics. This is really a tie, and I chose to include both because each team’s other jersey (Cameroon Away and Ghana Home) are too light colored to see any of the details which make the darker colored shirts so special. Apparently the design on the Cameroon shirt is taken from cave paintings, with “Les Lions Indomptables” written across each line. This comes from the team’s nickname, “The Indomitable Lions”. Ghana’s away shirt is a similar design, this one with Ghana’s nickname “The Black Stars”. The sleeve details are also good looking—while not being as eye-catching as the Kente design on the home shirt, the dark red is just too nice of a color to be ignored. I might still prefer Ghana’s 2012-13 kit (the fade is something I enjoy in shirts) but this year’s is still a unique piece produced for Ghana, and that is worth something in itself. This is the only shirt in this World Cup manufactured by the Swiss/Qatari company Burrda Sports—perhaps they’re getting ready for 2022? All three of these shirts carry elements of the Belgian flag, with the black away version the best looking in my opinion with the red and yellow sash across the chest. Belgium are being picked by many as a dark horse; while the outcome of their World Cup campaign may be uncertain one thing is certain—they’ll look good, win or lose. Germany’s white home shirt has a “V” design around the neck, which doesn’t represent too much of a change from their jerseys in previous years. The away shirt, however, represents a completely new move for “Die Nationalmannschaft”. Even if the red and black hoops and collar buttons make this shirt reminiscent of a rugby shirt I still found it extremely attractive when I saw it in person. In 2006 Germany moved to the black and red color scheme for their away shirts before moving to black for the 2010 World Cup. I think this represents the best Germany away shirt since they moved away from their classic emerald green kits (the Irish-looking green of Euro 2012 doesn’t count for me). For me, Russia’s away shirt is without a doubt the best jersey in the 2014 World Cup, and I don’t think I’m alone in that sentiment. Just below the collar is a view of the earth from space which then fades into white. Of course, this is in memory of the Soviet space program and Yuri Gagarin—the first human being in space. This shirt, of course, has a political connotation as well considering recent developments in Russia. As Putin looks to re-assert Russia’s strength in the modern era, this shirt advertising the greatness of Russia’s past on the world stage makes a bold nationalist statement. It will be interesting to see if this shirt starts a trend of countries visually representing their histories on football shirts—football shirt nationalism by using elements of The Modern Janus Theory (made famous by Tom Nairn). Dancin’ the night away–in pajamas?! I have no idea what this design is but it is definitely unique. Perhaps this was the beginning of the trend of providing special designs for African teams that we see now, since I have never seen this design used in any other team’s shirt. The white version looks a little pyjama-esque (hence its ranking as the ugliest World Cup shirt in history on one of the above lists) but, for my money, its still an unforgettable shirt. And that is what I look for. This shirt really needs no introduction as it is a piece of history, one of many legendary designs worn by Croatia since 1996. What makes this shirt special is the fact that just half the shirt is checkered. No one will forget Croatia’s historic run to third place while wearing this shirt, fueled by legends Davor Suker, Robert Prosinecki, and Zvonimir Boban (whose kick, some say, started a war). I’m counting on Bosnia-Herzegovina to make a similar run in this World Cup, even if their shirts aren’t quite as special. A few lists, including the one at the link above, have cited this shirt as one of the best World Cup shirts of all time and for good reason. This shirt is in Mexico’s classic shade of green with an interesting detail unique to Mexico: printed into the fabric is a design of the Aztec calendar. While this year’s Mexico design by Adidas is among the better designs on display this summer, I still think that nothing can come close to the France ’98 kit. This shirt has been derided by so many that it feels funny posting it as the number two best shirt—please see articles at Mashable.com and Slate.com for more on this shirt (albeit from a negative angle). Personally, I do not see why this shirt has so many critics–as you can see above, Alexi Lalas seems more than enthused to be wearing the shirt (!) even if Roy Wegerle gives us a more bemused expression. The point of a football shirt, in my opinion, is to represent a country in a unique and instantly recognizable way. 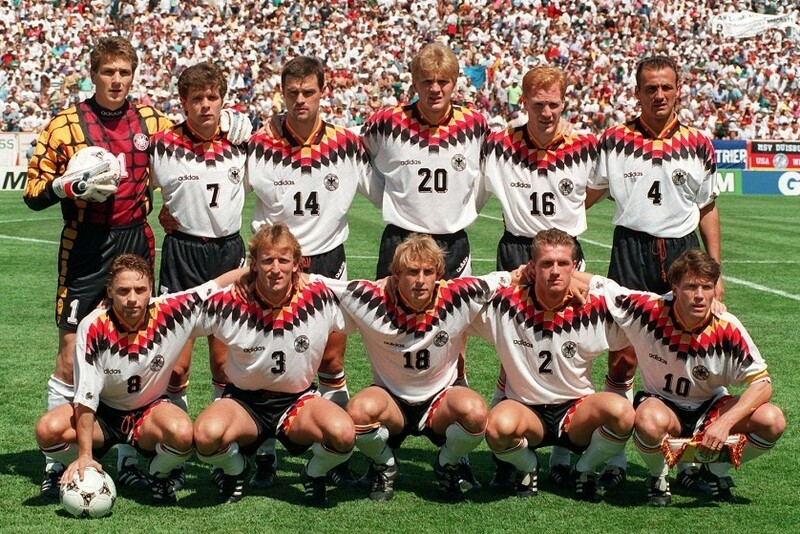 For me, that is exactly what the United State’s 1994 kit did. The denim look was certainly unprecedented, and it is true that it bore no relation to anything Adidas had—or has since—produced. But it was unique. In fact, it was uniquely American. As a kid watching the 1994 World Cup in I didn’t even notice the denim factor—I just thought it was a blue background with white stars, a representation of the national flag, which is fine. And for those critics of this shirt, I’d like to point out that if a USA shirt need be criticized the USA away shirt for the 2014 World Cup (a shirt I myself own) looks more French than it does American. I would like to think that like a fine wine, football shirts also get better as the years go by. That sentiment is confirmed for me by the number one shirt on this list . . .
And now we come to the shirt that—I think—is hands down the best shirt in World Cup history. If Helen of Troy’s face is the one that launched a thousand ships, then this is—undoubtedly—the design that launched a thousand kits. After Germany made this Adidas “basket weave” pattern famous the design became a staple for Adidas kits around the world between 1995 and 1996. The reason this kit in particular is so stunning is that the bold colors of the German flag really jump off the shirt’s white background and right into the viewer’s eyes. Adidas really did their country justice with this well designed shirt, a shirt that hasn’t lost any of its luster twenty years on. Another Istanbul night slowly bleeds into morning. A night that started in Europe on the docks of Beşiktaş was lived in Asia in the bars of Kadiköy and will now end in Europe on Taksim Square. The circular feeling of it all reminds me somehow of our lives, and it makes me want to document it. It isn’t the glasses of Rakı and Istanblue vodka that have me feeling this way—they’re being erased by a delicious Kaşarlı Döner in the Bambi off Taksim Square. The muezzin’s morning call to prayer rings out over the city, providing a backdrop for the voices of the group that has just entered Bambi; they carry LGBT flags. I don’t care. I care about the food. I look around. It doesn’t seem like anyone else cares either. This is a changing Istanbul. Having polished off our early morning snack and fortified our stomachs with a layer of grease my friends and I head off in search of a taxi and a ride home. The walk takes us across the vast barren wasteland that is the main square of the world’s 5th largest city: this is the state of Taksim Square in late spring 2014, the mark of the one year anniversary of “Gezi”. The change is half complete and the square has been pedestrianized. One would be forgiven for mistaking the place for a vacant lot. A few kids are playing a pick-up game of football—sweaters serve for goal posts as the clock nears 5 am. Where are their families? Where are their homes? Such a thing used to be unthinkable in Turkey. Now, it is becoming common. Urban renewal can have its own collateral damage, as homes in the “Red Light District” of Tarlabaşı are rapidly being demolished to make way for new luxury lofts. Supposedly the families will be transplanted to newly-built housing projects in the outskirts—I guess that the kids just want to play in the neighborhood they were born in; that they grew up in. They don’t want to leave their home—who would? My friend jokes that they’re making the best possible use of the vast concrete void. He’s probably right—football is healthy. But my mind is busy going back in time to an October night in 2012, when I took my nightly walk from Osmanbey to Istiklal Caddesi only to find the main street closed off in this very area—work had begun. I go back further to a March afternoon in 2009, when I began work on a manuscript about Turkish soccer. I remarked on how amusing it was that the first thing many visitors would see upon arriving in one of the most storied cities in the world was . . . a McDonalds (the final stop for shuttles arriving from Istanbul’s Ataturk Airport used to be on a busy road in front of a row of shops lining the edge of Taksim’s Gezi Park—among them McDonald’s and the mysteriously named Jimmy’s Fried Chicken). Now they’re all long gone. I’m too tired to think back to my first taste of Istanbul, back in the summer of 2005. My mother insisted I see the cıty and I did. I had been so taken by it all that I ended up studying at Bogazici University in the fall of 2006. No. This was not for tonight. But I knew that the next day I’d take a small walking tour of Istanbul, in order to see just what all had changed in the short time that I have known the city. Heading up towards Harbiye and Halaskargazi Caddesi from where I used to live the graffiti is the first thing that hits you. Scars of a year ago. In more conspicuous places the municipality has white washed it, but on the back streets its still there, as clear as the day is sunny. “Yaşasin Devrim” (Long Live the Revolution) is legible beneath the posters advertising Woman’s rights, written in Cyrillic and Armenian script. The posters are for the HDP, the People’s Democratic Party, a Kurdish party claiming to support minority and feminist rights. This last development is refreshing; too many women from the former USSR are trafficked to Turkey and forced into prostitution, living out their nights in the seedy bars of Aksaray. But such new parties are just a faint hope in the changing Turkey, as faint as their posters faded by the sun. Below the posters is written “Şamiyon Galalatasaray”[sic] and “Katil R.T.E.”—“Murderer R.T.E”, the initials of the Prime Minister Recep Tayyip Erdoğan. Misspelled football graffiti mixes with political graffiti in the new Istanbul. I trudge up the hill to the branch of a local cafeteria-style restaurant for lunch. It’s tough to find a table at which to enjoy my kuru fasülye and pilav—beans and rice, the Turkish staple—since most of the tables are occupied by Turkish riot police on their lunch break. Who knows what they’re preparing for, I’m not sure I want to know. I find a seat on the balcony behind two tables full of police but the door is too narrow for me to fit my tray through. A cleaning lady takes it from me as I sit down and watch my tray pass from her hands to one policeman and to another before reaching me. “That will be fifty Liras”, says the cop, laughing. Everyone can be human at the right moments in life. The food is good and I lean back digesting. Below the balcony is the wreckage of a building—urban renewal, again. From the table in front of me I hear the police talking. They’re like children, the jokes they make and the tone of their voice. It’s because that’s what they are. Most of the riot police (“Çevik Kuvvet”— literally “agile strength”) are high school graduates sent in to be the government’s muscle—kids fighting someone else’s war. There are examples of it all over the world, just rarely is the war being fought against fellow citizens. One of the youngest looking of the cops is hunched over a bowl of chicken soup, dipping his bread into it between spoon-fulls. The soup costs 3 Liras. 1.50 USD. It reminds me of an article written during the Gezi protests and, for a moment, I feel sorry for him. Fighting your own citizens with only a stomach full of chicken soup? It’s hard for even me to stomach. This is a changing Turkey. On Taksim Square it is another sunny late spring day as crowds meander through the no man’s land. On the newly-planted grass berm leading up to the infamous park “Istanbul” is written in flowers—two conspicuously foreign girls are sunbathing next to it. Meanwhile, paths have been formed where the grass has been worn-down by people taking short cuts into the park—normally, cops guard the entrance at the top of the steps. The fine sand that has appeared rips the façade of normalcy from the newly planted grass, exposing the area for what it is. A quick-fix beautification project meant to cover up the scars of a year ago. A few tourists take a picture of an Istanbul Municipality Tourist Support vehicle—a Smart Car. Another quick fix meant to paint over reality, a tactic used often in today’s Turkey. How many Municipalities in Turkey have Tourist Support Vehicles—that are Smart Cars, no less? I don’t spend too much time on it and the tourists took the picture so . . . I guess it worked. I turn my attention to the streets. They look the same as they did when I lived here in 2012, 2009, 2006. The asphalt has the same familiar broken white lines marking the lanes, the sidewalks remain—even the traffic islands. All that has changed is that a curb has been installed, blocking access to the still existent asphalt. Megalomania, and the desire to leave a stamp on a country and a city, does not mean that it is easy to erase the history of a city square—think of Times Square, Piccadilly Circus, Tahrir Square, Red Square . . . I could go on. But I won’t, its enough that the roads have endured—for now. But it is still a change that cannot be reversed. Walking down Istiklal I see a sight that worries me. A sight I’ve recently seen in other places; Levent, Beşiktaş, the central areas of Istanbul. Not to mention in every corner of the United States: A fast food chain. But this is not just any fast food chain, it’s a Turkish fast food chain. Their clean lines and minimalist design are so eerily similar to Chipotle that it gives me the chills. Kasap Döner has invaded Istanbul with the backing of a very large investment. They’re seemingly unbeatable. But how is the food? Sure, it’s döner in the sense of the term but it can’t be anywhere near Bambi, the company that invented the term “National Fast Food” in Turkey, right? I decide I have to try it and choose the wrap—“Lavaş” as written on their admittedly clever menu (Its better in Turkish) and a water. The water is designer—in a glass bottle—while the döner itself comes poorly wrapped, and with just tomatoes and French fries in it. I’m disappointed as I’m personally of the belief that any “dönerci” worth its salt should offer onions but Kasap Döner has no such option. I guess the patrons don’t want to smell. Before I leave I check out their upstairs—it is as sleek as the downstairs, complete with iPads at each table to expedite the ordering process. On the wall facing the stairs is a poster with the words “Chicken Wings, Onion Rings, Double Cheeseburger, Chicken Nuggets, Steak Wrap” written one on top of another with a clean slash through it and a döner knife below it. Above is the caption “Hamburger Çocuklarına Yedirmeye Geldik”—“We’re Coming to Feed the Hamburger Children”. The fact that “Hamburger Çocukları” is eerily close to the Turkish term for “Sons of Whores” (substitute “Hamburger” for a Turkish word your mother wouldn’t be happy to hear) should not come as a surprise to anyone. The Prime Minister’s often confrontational style of leadership comes from the fact that, sadly, such crudeness is often accepted in Turkey as a sign of strength. This is change—A Turkish fast food chain taking on foreign fast food by collaterally pushing out existing local culture—the smaller dönercis that will not be able to compete. It’s a symptomatic of a new Turkey, where money is all that matters—big business rules. I feel like it’s the 1960s in America, at the advent of McDonald’s and Burger King, and I vow to not play a part in it in Turkey. I’ll never eat a Kasap Döner again. I head down to the Galata Bridge and towards old Stamboul. On the hill leading away from Pera I see the traditional dönercis plying their trade in the shadows of the centuries old Galata Tower. Their shop is traditional but they might not be so—one takes a picture of the other with an iPhone. Another change. At the bottom of the hill I take a stroll across the Galata Bridge. I’m almost blinded by the azure waters of the Golden Horn and imagine myself in another era. I’m five, fifty, two hundred and fifty years in the past. At least this will never change. Perhaps. On the steps leading to the lower level of the bridge the Dynamo Kiev graffiti I had photographed a few years ago has been painted over, replaced by “Çare Drogba”—“Drogba is the Solution”, red paint peaking out from beneath the grey paint the municipality hastily slapped on. It refers to a cheeky refrain born out of the Gezi Protests of a year ago, a nod to Galatasaray’s Ivorian striker Didier Drogba. Later on, past the throngs of tourists outside the spice bazaar and Turkish shoppers clogging the narrow alleyways of Eminönü, I near Beyazit Square behind the Grand Bazaar. Here is, perhaps, one of Istanbul’s best dönercis. It is not really a restaurant, per se. In fact, one would be forgiven for missing the place entirely if not for the long line that seems to be present every time I walk by. The place is literally a hole in the wall with four employees: one dönerci, two men inside assembling the döners, and one man taking the money outside. In stark contrast to Kasap Döner’s menu with its modern graphics, here the menu is printed in black and white on plain printer paper. The concept is simple—A quarter loaf, a half loaf, or a full loaf of bread filled with your choice of a single portion, 1.5 portion, or double portion of meat. Along with the meat comes tomatoes and a pepper—no onions here, either, but at least there are no French fries. The idea of carbs in carbs—fries in döner sandwiches—is an Istanbul thing. It isn’t hard to understand why—so many people struggle to get by in the metropolis that the fries provide a cheap and filling addition to sandwiches. Emphasis on the cheap. I choose a quarter loaf with a 1.5 portion of meat, and have them add some crushed red pepper. I’m not hungry at all but I need to erase the taste of Kasap Döner. I need something that hasn’t changed, and the local dönerci is just that. I’d be surprised if this place has changed at all since 1960s Istanbul. Walking off the food I find myself in the tourist quarter of Istanbul. Syrian children swarm around me and I bat them away like flies. They roam in packs, surrounding you, trying to reach their small hands into your pockets. You have to be alert, tell them no, they only need one stern “No” and they’re off to the next—there are a lot of easier targets on Sultanahmet square. But, most importantly, you can’t be mad at them. It’s not their fault that they are living on the streets of a city far from home. In an alley in Sirkeci, near the train station, I walk by a man and a woman. They speak Arabic, wrapped in a blanket huddling against a wall. It seems that all they own is with them at this point, strewn across the sidewalk. Their children—if they have any—are probably being swatted away in other corners of the city. Or maybe they’re making a living. And it’s not their fault either. They are just victims of larger polices, many of which are flawed. This is a changing Istanbul. My heart feels heavy as I walk by the docks. More packs of Syrian children, boys and girls—some groups of up to fifteen strong. I dodge them as I walk, heading back towards the Galata bridge. I stand among the fishermen, and look to the green hills of Topkapi Palace, and on to the Bosphorus. “Yes”, I think. “This is a view that will never change”. And then I slap myself. “Of course it will change. Everything changes.” It only becomes truer when making money—and not respecting humanity—is the only goal. I’m not the first person to write about it but living it—feeling it—is much different than reading about it, so I share my walking tour with you.